Built for military purposes at the initiative of Romania's last communist leader Nicolae Ceausescu, this dynamite-forged road connects two of Romania's historic provinces Transylvania (the Center) and Walachia (the South) through a series of five tunnels, 27 viaducts and 831 small bridges. 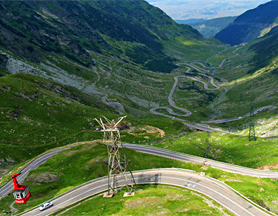 The TransFagarasan ranges in elevation from 1,630 feet at Cartisoara to almost 6,700 feet at Balea Lac. The road is below the tree line until about 5,000 ft. and then it opens up and reveals itself. No visitor should not get discouraged by the significant elevation difference; the road is a relatively easy climb even for bicyclists weighted down with all necessary equipment. The Transfagarasan was engineered to be accessible to heavy military vehicles and the gradient is never too steep, hence the many hairpin bends or switchbacks. 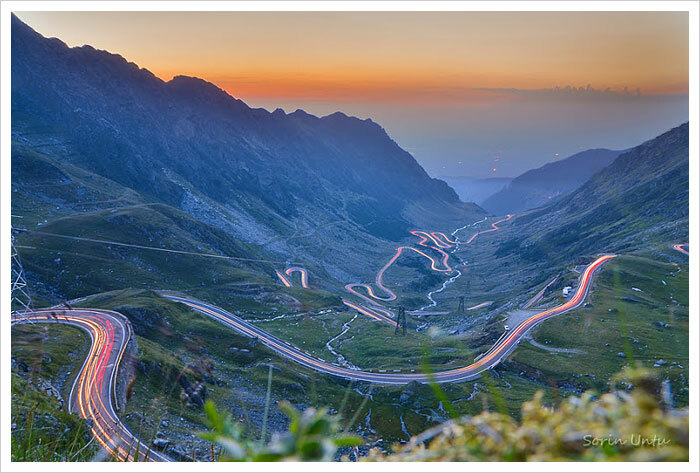 Although it is the best-known scenic drive in Romania, because there are faster roadways that connect southern and central Romania, the Transfagarasan is still relatively unperturbed by the motoring masses. Distance: 71 miles (114 kilometers). Open end-to-end: late June through end of October (weather permitting). Route time: 3 hours, without stops. A leisurely drive can take all day. Golul Alpin nature reserve, Balea Glacial Lake, Balea waterfall.